The firm which operates Britain's rail network has beaten its punctuality targets for the first time. Network Rail has this year cut delays on its services by 16%, the equivalent to 2.2 million passenger minutes. It said 83.5% of trains arrived within five minutes of their due time - beating the Rail Regulator's target of 82.8% of trains. But other figures have revealed safety concerns, with a rise in the number of trains passing danger signals. Figures show that for February there were 23 cases of signals passed at danger (SPADs). This was four more than in February last year, the Health and Safety Executive said. But the figure was nine fewer than the February average over the last six years, and the number of "serious" SPADs fell from 11 in February 2004 to six in February this year. The figures on punctuality show that there still are fewer trains arriving on time than before the Hatfield disaster in 2000. Network Rail - which is launching its third 10-year business plan - says it expects to return to pre-Hatfield punctuality levels by the end of the summer, several months earlier than planned. BBC transport reporter Rebecca Pike said one reason for recent improvements was the introduction of joint control centres, in which staff from train companies and Network Rail work together to sort out problems. Another factor was a massive investment programme, which is beginning to yield positive results. A further £20bn is due to be spent improving the network over the next four years. Network Rail also plans to reduce delays by a further three million passenger minutes by 2008-09, and reduce the number of broken rails by a further 8% over the next year. Commuter Beverley Cox, who has been travelling between Purley and London for the past five years is used to long delays, but says things are improving. "I'd find it was quite stressful coming home especially evenings, trains would be delayed or cancelled," she told BBC News. "I could take nearly two hours sometimes to get home rather than my normal hour journey but now I don't find too many problems." Network Rail Chairman Ian McAllister said improvements to train punctuality had come a long way. "We've made substantial improvements in the last year, and now we want to go even further, even faster," he said. He said the reduced delays were a "superb achievement", evidence of employees hard work and a better relationship between train and freight companies. 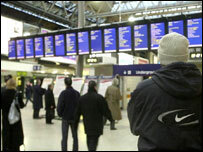 Rail Passengers Council chairman Stewart Francis cautiously welcomed the news on punctuality. "Passengers are now experiencing the fact that NR is starting to shift their performance in the right direction and seem to be saving money along the way. This is good news," he said. "NR's 10-year business plan looks ambitious but we will have to drill into the detail before we see if it matches passengers' priorities for improving the network. "It also only forms half of the picture. Until it is matched with train company plans, then we cannot form a full picture of what this means for passengers." The Liberal Democrats also revealed figures claiming passengers had lost in total of more than 12,000 years on delayed trains since Labour came to power in 1997. "Every major network in the country has declined under Labour. The government's inability to maintain a safe, reliable and affordable rail network is costing the nation dear," said Lib Dem transport spokesman John Thurso.